Pam's Recipe Box: Sardines, Anyone? 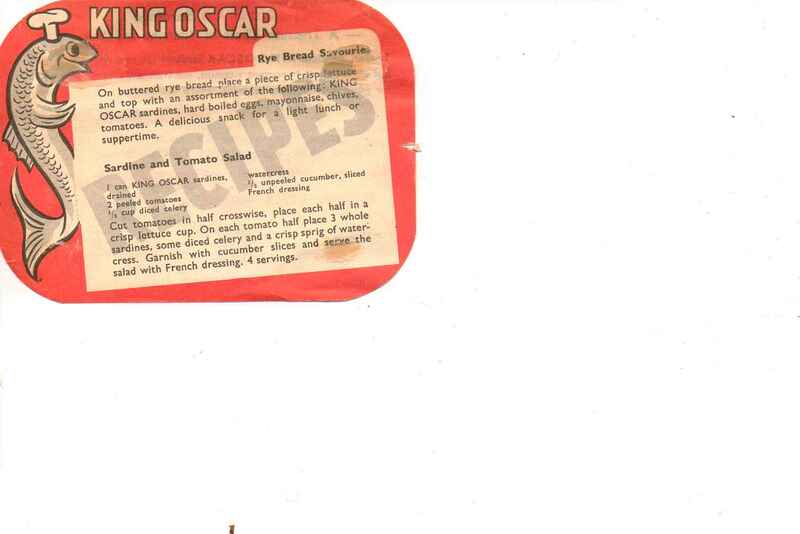 This was found in Grandma's recipe box as a label that was apparently saved from the top of a sardine can. The first recipe is for a snack "Rye Bread Savories". This scrap of paper jumped out of the box by itself, which is why it included here now. (Not because I like sardines, for sure! Apparently Grandma did!). The second is for a salad. Yummo! On buttered rye bread place a piece of crisp lettuce and tope with an assortment of the following: KING OSCAR sardines, hard boiled eggs, mayonnaise, chives, tomatoes. A delicious snack for a light lunch or suppertime.